I was given this product to try and review by www.myperfectgoatee.com. The opinions are my own and the people I had help me test the product. 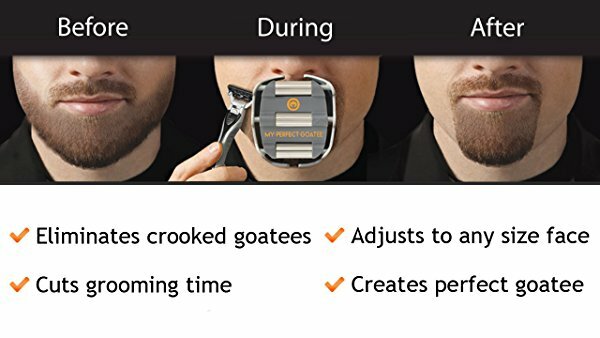 Today's product review is the My Perfect Goatee and according to the history on their website, was born out of a personal need to maintain a straight, even and professional goatee. 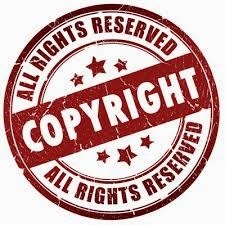 The inventor began looking for a product like this while in college, but could not find anything already produced to solve this issue. After looking for over ten years for a product that fit his need, he decided to invent MyPerfectGoatee. MyPerfectGoatee’s first design was made with modeling clay and Popsicle sticks but after making and testing prototype after prototype, the MyPerfectGoatee product today is made from ABS plastics, using an injection molded process. A far-cry from Popsicle sticks and modeling clay! necessity of having to shave off the whole goatee. and worry that it will be crooked." Apparently, growing, grooming and perfecting the style of your goatee is an art. The MyPerfectGoatee can use any type of razor. It can be used with shaving cream and razor, or with electric razor. It has a mouthpiece for holding between the teeth for stability while shaving and is adjustable at the top, middle, and bottom to get the perfect size and shape. Saves time by allowing precise shaving of your desired goatee shape every day. Creates & maintains a perfectly shaped goatee. Eliminates crooked goatees and those occasional shaving mishaps. Adjustable template to fit most size faces and different goatee style. This past weekend I had a chance to give the MyPerfectGoatee to a guy who was willing to help me out with this product review. He had never seen the product before and the only thing he knew about it was that he was to use it as directed and give me his honest thoughts. He laughed when he got it and his first reaction was, "It's kind of weird..." But he was willing to be a guinea pig for me and.... it worked great! No guesswork, no uneven lines. The results are immediate and after trying it he determined it was easy, he liked it and "yes" he would use it! 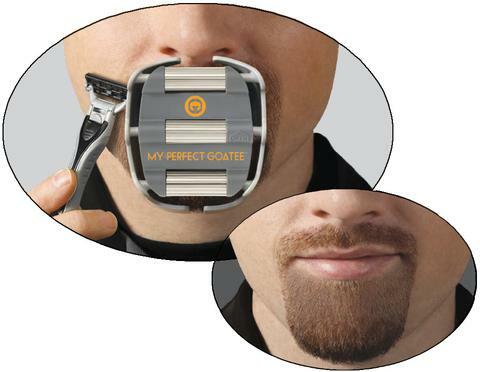 The My Perfect Goatee is available in many places, including Walmart and Amazon as well as on www.myperfectgoatee.com where they offer free shipping in the USA; Canada and Mexico $5.99 and worldwide for $9.99. In August of 2006 I gave you a great recipe for turkey burgers using just a couple ingredients to somehow produce the most delicious and simple burger. Considering that was about eleven years ago... it's time to post it again. If you are like me, you will look at this short list of ingredients want to embellish it and add 'more' of something or other. You can of course - it's your kitchen - your food - your choice. But you really don't have to. It's good just like this! Mix together with your hands and form into patties. Cook over medium heat in 2 T olive oil. Cook approximately 5 minutes, flip and continue cooking another 5 minutes until done. Serve on a bun with fresh lettuce, sliced tomatoes and ketchup. My kids always loved to put homemade Ranch dressing on theirs and now that my son is 25... he still does. 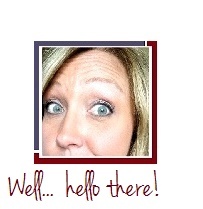 If I can get this post finished and you can actually read it, I'll consider it an accomplishment! I'm currently out of state again; helping babysit a 17 month old and a 3 year old this week. While I'm sitting at the kitchen table trying to finish this post, I'm also helping coloring Halloween pictures and practice writing a-b-c and 1-2-3.... and apparently trying to teach 'sharing' to a very belligerent three year old. Last night we had a yummy chicken and long grain rice soup I whipped up. I was able to make it while the little ones were napping and let it simmer slowly on the stove until it was time to eat. I wanted to use 'my' regular recipe but it's currently written in a notebook, sitting in my kitchen, about 800 miles away. Instead, I remembered some of it from memory and had to improvise on the rest using the 'typical' and average chicken and wild rice soup mixture online. It was pretty good - not exactly 'mine' but until I can get back home and recall just what it was I was missing in this one, it will do. I did improvise with a few things and hope you do if you wish. I happened to have a box of Uncle Ben's Wild Rice boxed mix in the pantry of the house I'm staying in so I used that in this recipe because the wild rice mixture they had hardly had any long grain wild rice in it. I really loved the addition. Last note: Like most similar rice dishes and even soups or stews in general, the leftovers get very thick. If you want to eat it nice and thick just heat it up as is (it will thin a bit of course when hot) but you can also add water to thin it to the consistency you wish; and the flavor is not diminished. Cook your long grain white and wild rice according to the package directions of the brand you chose. Mine called for a quick boil and simmering 45 minutes. I added my raw chicken to it and cooked them both at the same time. Simmer the chicken broth, celery, carrots, mushrooms and seasonings for about 25 minutes or until the vegetables are tender. Melt the 1/2 cup butter and stir it into the flour to make a paste. Whisk this into the hot broth. Add the mushroom soup, rice, chicken and if you choose to use it, the package of long grain rice and seasoning packet (totally optional). Heat through and serve. I served with a garlic Naan bread warmed in the oven. 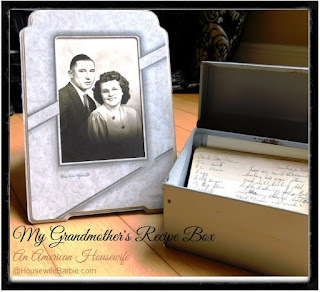 The first week of October I did a post to explain a new series I was doing on An American Housewife after I decided to photograph & post-to-save old handwritten recipes of my grandmothers. Today has been an emotionally 'busy' day and I need to just decompress a bit and focus on something else for a bit so I decided to do the next recipe in the series. This one gave me a heck of a time trying to figure it out! It's so incredibly loved that it's impossible to read. I had my husband and one of my daughter's give me their best guess and then I took a photo of the card and blew up to about 400%, changed the contrast, etc. and I finally got it based on what I could read and the list of ingredients. I've traced over the ingredients to make them easier to read. Mix the dry ingredients in a bowl. Beat the egg in a separate bowl but only until just blended; don't over beat. Pour the carbonated water into the egg, stir briefly and add to the dry ingredients. Mix or whisk quickly just till blended; again, don't over beat. Dip pieces of seafood of your choice or pieces of chicken into the batter and fry in hot oil until golden brown - be sure to turn a couple times so they cook evenly and don't crowd the pan. Drain on paper towels. Serve hot. I had some mixed seafood in the freezer so I just thawed that and used it. Oysters are my favorite! Although spiralizers have been around for ages, I've always wanted one, but it was never really in the budget and not a priority. A couple months ago, after not really being happy with any of the low carb pasta options 'out there' as my favorite go-to; I decided it was time to invest in a spiralizer. However, after spending WAY too much time in the small kitchen accessory aisle and over thinking everything, I finally decided on this one: The OXO Good Grips 3-Blade Spiralizer with Strong Hold Suction. No learning curve. Easy to use and figure out right out of the box. Perfect cuts and sharp blades. A lousy photo taken quickly on my phone... but shows my first use. So quick and easy. I've used it numerous times since then and it's still just as perfect and easy as ever. You can see the vegetable plugs that are left after spiralizing. You can still cut them up and add them to your dish. There is no waste. My little helpers and I made two (2) blueberry pies yesterday! Although I planned to make it completely from scratch like usual, I realized with a 3 year old and a 16 month old wanting to 'help' and trying to get two dinner meals made (one to eat and one to refrigerate for the next night) AND the fact we weren't starting until about 5:00 that afternoon.... while I was at the store picking up some groceries, I opted for a few 'already made' store bought items that made the fun little project quick and easy for all. A double pie crust (I don't have time to post the recipe - so use your recipe or just buy the canned or frozen version). Mix the ingredients together in a bowl and then place in the bottom crust. Top with the cut up butter and then carefully place the top crust over and crimp or use a fork to seal the edges. Slice a pretty star shape on the top with a knife or fork to let steam escape. Bake at 425 for 20 minutes and then lower the temperature to 350 for another 30-40 minutes. Let cool and serve with vanilla ice cream or fresh whipped cream. I've listed this recipe on here before but I want to add some notes to this one. You can ALWAYS 'play around' with a recipe and add and delete on a whim. I wanted to let you know what I do to perk this one up sometimes. I've used all of the above at one time or another. Just a light sprinkle of one or two of them together really brings out some flavor in this pie. Pre-bake the crusts for about 10 minutes for a better textured bottom crust. Pour the pie filling into the deep dish pie crust. Top with the fresh blueberries. Use the second crust to turn over, upside down onto the pie/fruit. If it's frozen, let it set about 10 minutes, if it's thawed, continue right away to crimp the edges to seal. Slash some holes in the top and mix the sugars together and sprinkle all over the pie. Sprinkle with cinnamon. Bake in a preheated 400 degree oven about 50 minutes or so. If the crust is getting to brown on top just place some aluminum foil over the top and continue cooking. Remove and set aside to let cool completely. My adorable little helpers.... snitching blueberries from the pie! He takes his work very seriously! Sprinking the sugars are very, very important and shall not be rushed! So proud!!! And has blueberry smudges all over his mouth and nose! Ha ha. So cute. Ready to bake pie number one! We followed up with a second pie as they freeze very well. Homemade Blueberry Pie - Easy as.... Pie! Back during the early days of this website, the internet was a bit different - and hadn't grown to what it is today. One thing I've noticed is google wasn't indexing a lot of pages like it does in this decade. There are so many of my recipes that I love and know I had posted at some point, but trying to search for them isn't always easy. My blueberry pie is one that I always have to search a little bit harder for to find. This week I'm out of state - but still doing a lot of cooking and baking. Just not taking pictures. Yesterday I did actually take some photos to share with my own family as I helped the 3 year old make his very first blueberry pie. Since I have some photos and I'd like for my blueberry pie recipe to be easier to find (for me and for anyone else who might be searching for one) this is the original post from May of 2007 (over 10 years ago!) and I'm also going to post yesterdays pie-baking fun next. This is one from my files... I think back in 2011 maybe? A LONG time ago. It's one I'd play with a bit - tweak it as you wish. Some ideas might be to use an alfredo sauce instead of the evaporated milk if you are pressed for time; or maybe add some jalapeno's or bacon crumbles! In a pan on the stove, combine evaporated milk and Ranch dressing. Heat and stir over medium low heat and add the chicken. Season with salt and pepper to taste. Simmer, uncovered, 25 minutes stirring frequently. In a 9X13" pan, layer 3 lasagna noodles, spread with half the chicken/sauce mixture, and some of both cheeses. Repeat layers. End with the noodles and sprinkle on the last of the cheeses. Use a bit more if you like. Bake at 350 for 35-40 minutes or until hot and bubbly. Let rest 10 minutes before serving to let it firm up. How to stop guacamole from going brown? Freeze it! Avocados can go from unripe and hard to 'over' ripe and stringy in just a couple days. You have to use them at the height of their quality or often have to toss them in the trash. When you have a few to use up before they turn, or you just want to have guacamole on hand for a future meal; make it and freeze it! Simply make your favorite recipe for guacamole, or just chop and mash it with a bit of lime juice and a dash of salt and put it into a tightly sealed container with a lid; packed up to the top if you can to allow for less air - but because it freezes fairly fast, it isn't likely to brown before it's frozen anyway.